Thailand has shined optimistic light under its Thailand 4.0 economic model and will continue to lead as an emerging economy in 2019. Its economic model is to implement a value-based era defined by reformative strategies including the Eastern Economic Corridor (EEC) master plan to radically transform the national economy with high-technology and innovative manufacturing. As Thailand’s High-speed Rail completes, its capital city, Bangkok, will soon have all three of its airports linked to the rest of the country to broaden its trade sector with a high-end logistics and supply chain to further propel its economy. Thailand 4.0 will reposition Thailand into a high- technology, high- value and high- creativity economy by 2036 with an emphasized development in 10 strategic and innovation-driven industries, namely, next generation automotive, smart electronics, luxury and medical tourism, agriculture and biotechnology, foods, artificial intelligence, aviation and logistics, bio-combustion and environmental protection, digital technology and high-end healthcare. Through the imposed economic model and the 10 reformed industries, the Thai government is determined to increase the nation’s GDP from 3% to 6% and create over 100,000 job opportunities by 2020. The plan will place Thailand into a new era as a high-income nation and move towards an inclusive society by reducing inequality among social classes. 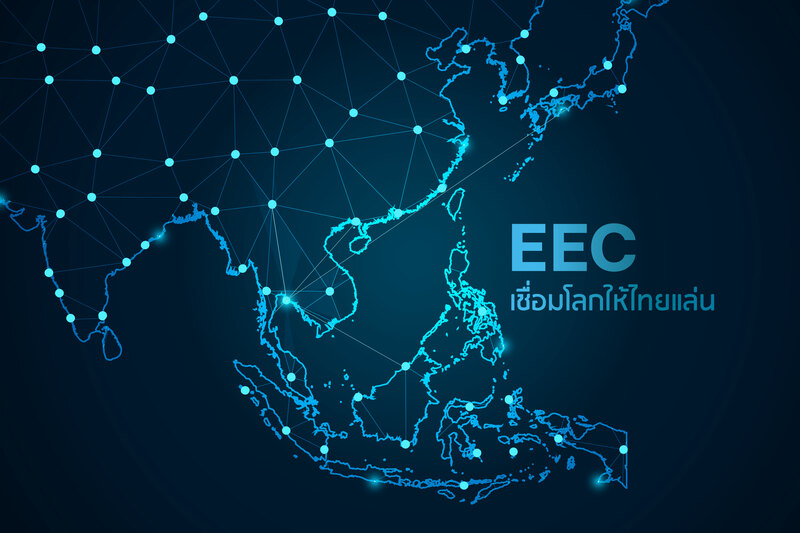 The Eastern Economic Corridor (EEC) is slated to be an arterial gateway for trades, investments and regional transportation as part of the Thailand 4.0. economic model. Stretching at 13,528 square miles, 12 times the size of Hong Kong, Chachoengsao (east of Bangkok), Chonburi and Rayong are deemed as the economic zones within the government’s plan to place the Thai economy as a leading engine of growth and trade hub within Southeast Asia. With existing infrastructures to power the EEC plan, the three eastern provinces already provide a foundation for Thailand’s ambitious plans. New legislation and regulations additionally came into force to attract foreign direct investments (FDI), including the incentive for long-term land lease agreements up to 99 years, relaxing visa requirements for foreign professionals and implementing strategies for departments to review investment plans to hasten approval rates. By 2017, the EEC plan has already attracted over 9.3 billion USD worth of FDI fueling a superior economic growth in the region as reported by The Board of Investment of Thailand. The Chachoengsao, Chonburi and Rayong provinces are strategically located in central Thailand and its Southeast Asian neighbors. Operation plan of the EEC will develop seamless logistics systems linking transports on land, sea and air to Cambodia, Laos, Vietnam, Myanmar and Southern China with possible expansions to the Pacific and Indian Ocean as an economic gateway into all of Asia. The linkage of U-Tapao Airport, a former airbase for the military, Don Mueang International Airport and Suvarnabhumi International Airport will complete an important circular logistics chain to draw tourism, businesses and trades into Thailand’s flagship policy. The linkage will add significance to the country’s logistics chain by increasing investment potentials and facilitating development of economically significant activities. The 220-kilometer-long High-speed Rail, connecting the three airports will pass through Bangkok, Samut Prakan, Chachoengsao, Chonburi and Rayong. Expected to cost over 224.5 billion Thai Baht, it is now under tendering. The Thailand 4.0 economic model and the EEC Plan have created a number of job opportunities, which in turn have stimulated housing demands. Property markets along key development districts and the High-speed Rail have created a housing boom with districts outside central Bangkok and nearby Don Mueang and Suvarnabhumi International Airports, where both remain in close proximity to the CBD, experiencing large increases in value due to a rising number of expatriates from international logistic firms, aiding in a rapid stimulation of the property market. About Golden Emperor Properties Inc.